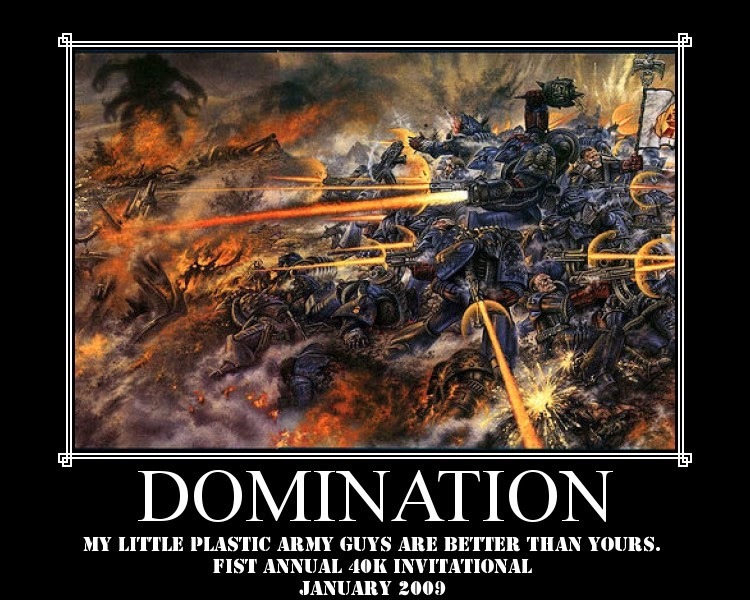 I've been playing 40k for as long as I've been playing D&D. I saw the Rogue Trader book at a game store in 1987. I begged my parents to buy it for me. I got it the book for Christmas that year. They did and it was all over after that. I've played every edition of 40k. I now own 5 armies: Orks, Tyranids, Space Marines, Chaos Space Marines, and Eldar. The Orks are my favorite. That army is so large it should probably counts as two. 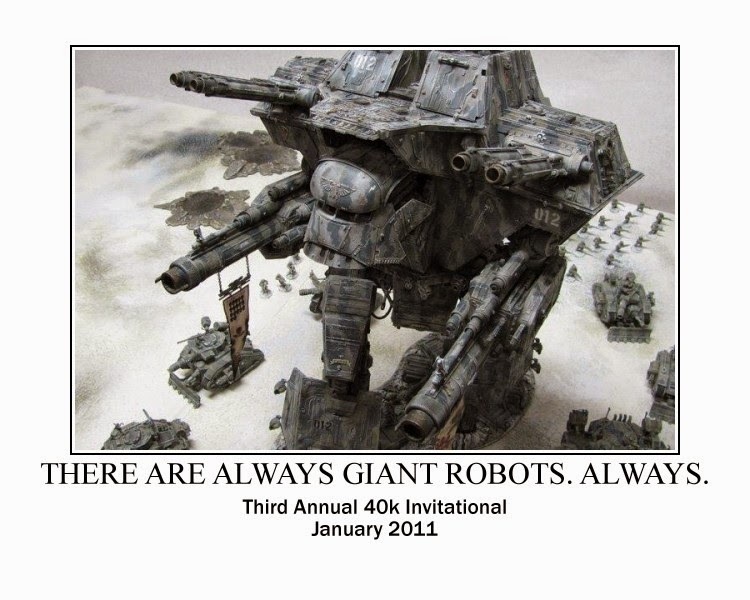 Back in 2008, my brother, who lives in Oklahoma, and I were playing a game of 40k. 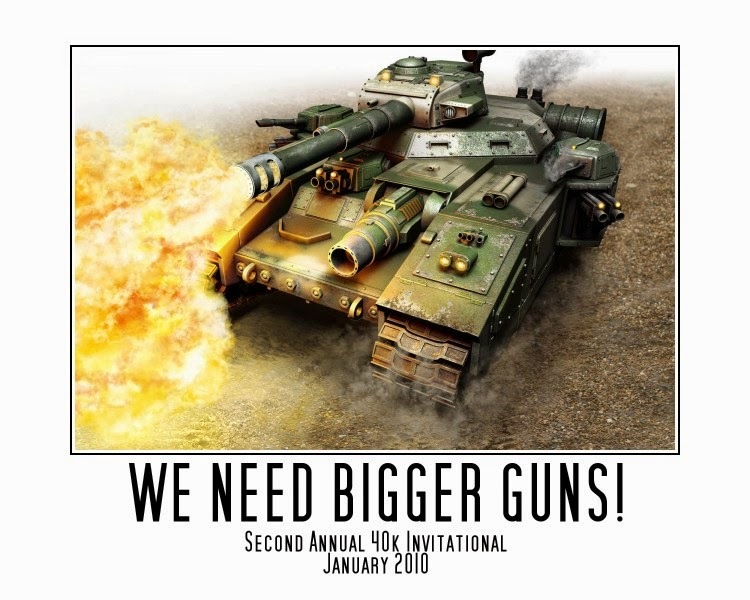 We started talking about getting all the Oklahoma and Texas 40k players we knew and play a big 40k game. I suggested I host a tournament! And so we did. Yes that does say "fist" instead of first. Eight people showed up to battle it out over two days. Everyone had a blast! So we did it again! In 2013 we moved it to February, with everyone having kids it was too close to the holidays. And now we've been doing it for 6 years. 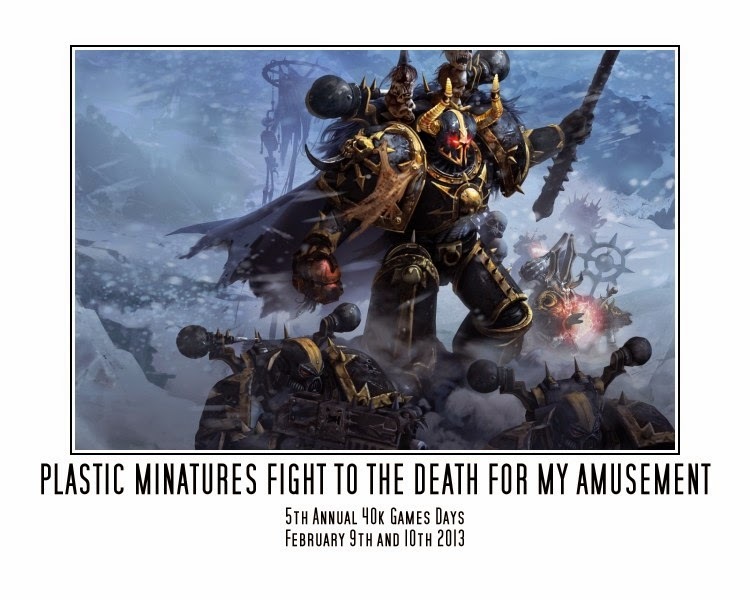 I didn't think it would last this long, but it's the reason we all still play 40k. Everyone spends all year working on their armies and playing in order to prep for the tourney. The tourney is a mini-convention now. Everyone arrives on Friday and we play RPGs or boardgames all day. 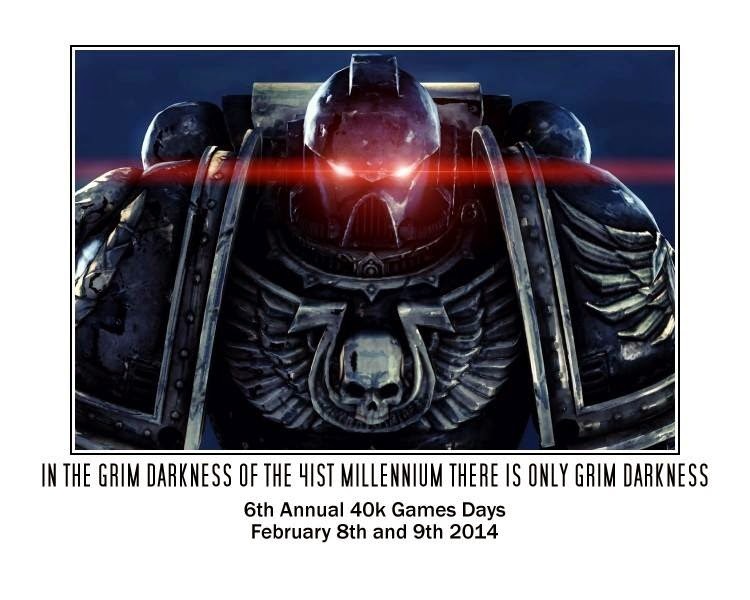 On Saturday, we play 40k all day and then more boardgames that night. 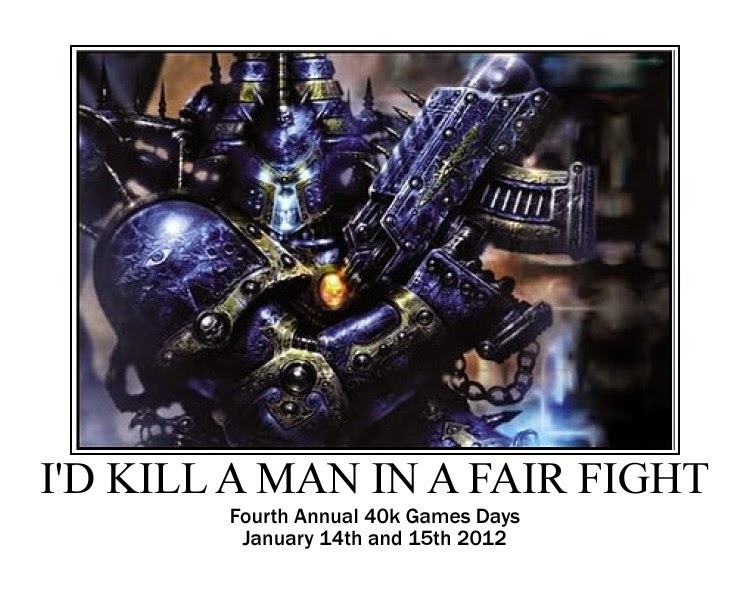 On Sunday the final two games of 40k are played and everyone packs up and heads home. A lot of beer is involved. At some point it grew from 8 people to 10 people, with a few players coming from even further away than Oklahoma. 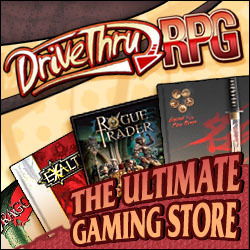 Some players suggested that we might have to move the tourney to a game store if it got too much bigger. I reminded them that a game store would probably frown on the coolers of beer and multiple bottles of whiskey that go along with our tourney. This years tourney is already set and I'm planning to playtest my Thundarr DCC game on anyone who shows up on Friday! Have you seen this weeks Bundle of Holding? All kinds of cool OSR retro gaming stuff in the bag! I snapped it up right away. The Labyrinth Lord books and Dyson's Delves are worth the price alone. I haven't had a chance to look through it all yet but the Lesserton and Mor sandbox looks nifty. Check it out! I had planned to switch my weekly face to face game from Star Wars Edge of the Empire back to Swords and Wizardry this week. We had put S&W on hold to try out Edge of the Empire for a bit this summer. One of the players has been joining us remotely, and she asked if we could put them both on hold till January when she would be back in town and could play in person. Absolutely! I then solicited the other players for what games they would like to play from now till January. We have a long running Call of Cthulhu Delta Green game. I looked at my campaign notebook the other night and the first session was dated 10/10/2007. Seven years! That was an immediate suggestion for our next game. Two of the players also put forward the idea of picking up our Runequest game that had wrapped up last year. I wasn't too sure about that. Runequest is a lot of work. The rules we use are mismash of Mongoose's Runequest and RQII as well as my own house rules. My plan was to move the campaign over to Griffin Mountain, but it was going to take time to get that started. Then I remembered one of the best adventures we'd played was "Hellpits of Nighfang" by Jennell Jaquays. It's a neat Runequest dungeon crawl like some of the older D&D adventures. I'm a big fan of the S-Series adventures from TSR. I thought, what if I converted White Plume Mountain to Runequest and run it as a one off dungeon crawl? Stats for Runequest versions of the iconic weapons were already forming in my brain! I did some searching around and found there are a wealth of resources for converting AD&D to Runequest. First I found this article that someone had written on the web a while back - Converting AD&D to Runequest. (If you know who wrote this great article, let me know so I can give them credit.) The article was written by Bryan Malone, thanks to Matt Miller for letting me know. Digging a little deeper on BRP site I found a conversions of the Monster Manual and Monster Manual 2 to BRP stats! Now we're cooking! Finally, going back to the original source material itself, All the Worlds Monsters Vol 3 has a section on converting AD&D to original Runequest. These are all for converting D&D to original Runequest and the BRP Runequest clones, which is slightly different from Mongoose RQ/Legend/Runequest 6. (There are almost as many RQ clones as their are D&D clones.) 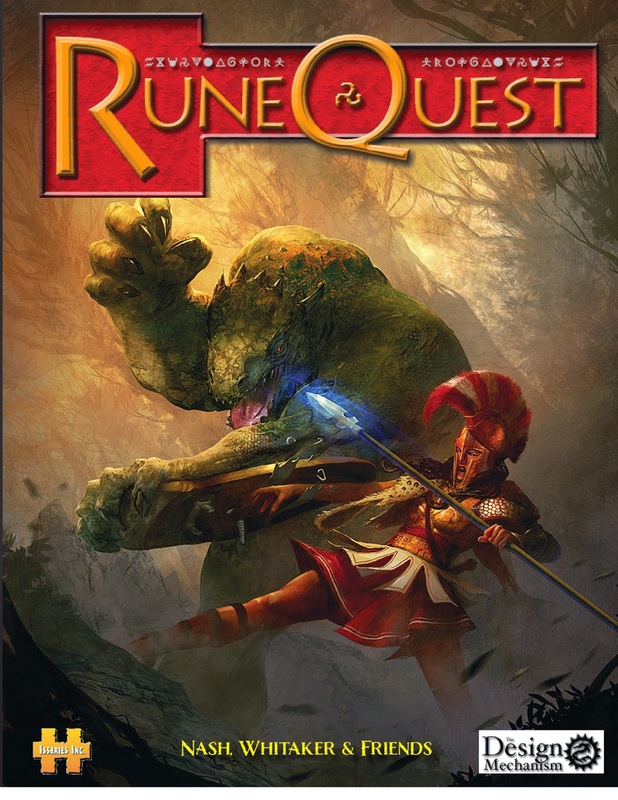 It's not hard to covert between versions of Runequest though. Somewhere I've got my notes from converting Hellpits of Nightfang from original Runequest to Mongoose Runequest. I'll post my conversion notes as soon as I find them. 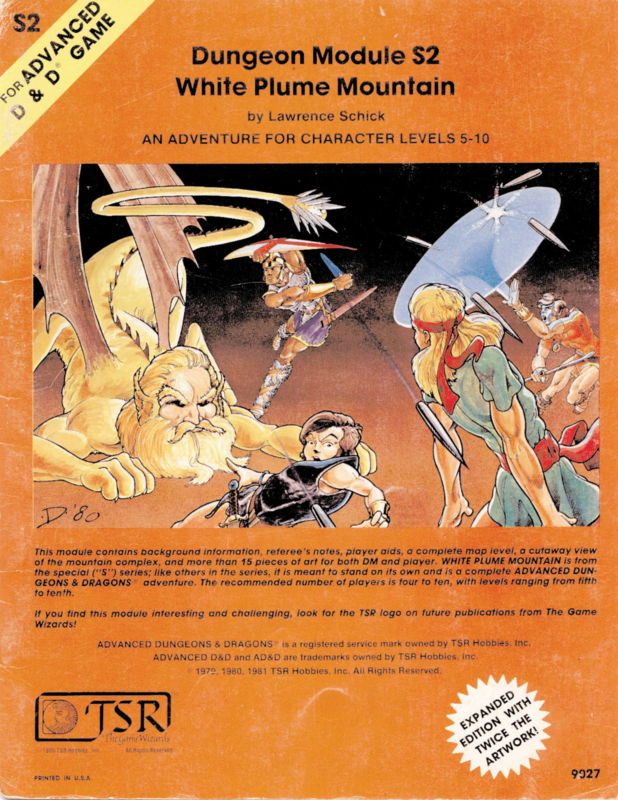 So now I'm excited to start converting White Plume Mountain over to Runequest! I'll post the conversion here once I run it. There must be some kind of Rune Spirit going around right now. Over at Dispatches from Kickassistan, +Adam Muszkiewicz just started a Runequest 6 game as well. 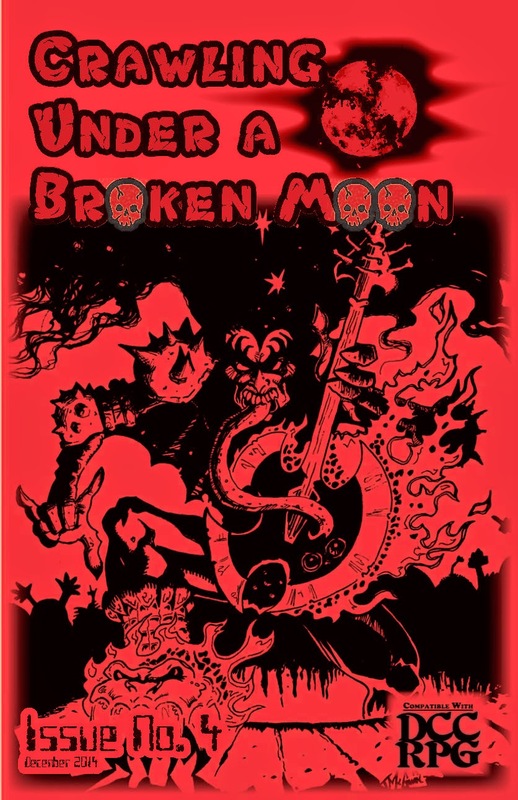 This week +Reid San Filippo released Issue #4 of Crawling Under a Broken Moon. Everyone should run out and buy it right now! It's an awesome issue containing 3 patrons for post-apocalyspe DCC games including Kizz, the intergalactic god of Rock and Roll. It also has my first ever published work: the Solar Saber! I'm certain it will be a valuable collector's item. To celebrate, I'm giving away issue #1 and #4 of the zine! To enter simply shoot me an email (rymoore AT channel-zero DOT net) or comment on this post, or however you want to let me know. I'll gather up the entries this Sunday at 9pm CST and roll an appropriate sided die to determine the winner. Shipping is on me, and as long as UPS or Fedex can get it there, international is fine. UPDATE: The man himself, +Reid San Filippo has offered to send PDFs of both issues as well!